I'll get this out of the way right now: I love this album. I really love it. I have played it over five times and each time it reveals something new to me, always something enjoyable. It's one of the best albums I've heard in the last year, and quite possibly the last few years. 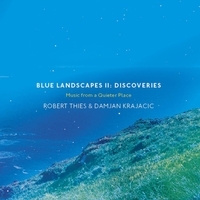 These two musicians, Robert Thies (piano) and Damjan Krajacic (flutes) are not just on top of their game; they are so tuned in to each other and so masterful at their respective instruments that I am left nearly speechless to come up with the right superlatives to describe the brilliance that is Blue Landscapes II: Discoveries. This is the second in the two musicians' series sub-titled "Music from a Quieter Place," and I never got around to reviewing their first one, but if my memory serves me, it was pretty outstanding too (back when it came out, I had scant time for any reviewing, so it was not a lack of the previous album's quality that inhibited my writing a review of it). I admit to being unknowledgeable if there is a subtext to their decision to title this series Blue Landscapes, but with how gorgeous this music is, they could title it Swampland Memories and it wouldn't dampen my enthusiasm for it! Per the liner notes, the fifteen tracks on the album are the outcome of 30 hours of improvisational recording sessions over five days and it's meant as an expansion of the first Blue Landscapes release. While this is obviously improvisational (to my ears at least) this is not just the two of them noodling around aimlessly in the studio. Instead, like all great improvisations, the music has a distinct organic aspect, whether Krajacic or Thies takes the lead, seeming to evolve patiently, the way cloud patterns in the sky can slowly morph from as they traverse the blue background. Another nature-based analogy might be to a meandering stream carrying a leaf on its lazy current to its eventual destination. Upon first listen, you may think "there's no way this is just piano and flute" but it is (with the exception of a synth melody on the track "Discoveries"). Again, per liner notes, Thies and Krajacic accomplished the variety of sounds by "…incorporating effects and extended techniques…expanding the traditional color palette of both instruments." So, while you may think that you're hearing rhythm programming on "Across the Open Fields," you're not (I am not a wizard so don’t ask me what it actually is, except that it infuses with the song with a bouncy liveliness and an air of such good cheer that it's damned near impossible to be in a bad mood during the track). While some songs do inhabit this same territory of being uptempo and/or light-hearted, the majority of the music on the album is serene, contemplative, occasionally haunting, and many times there is a pleasing pastoral feel to the music. Krajacic plays a lot of different flutes which, obviously, color each track in different hues, whether wooden/Native, silver/classical, or any of the others that I can detect (the types of flutes are not specified in the liner notes). His playing style also varies, from short bursts to long drawn out notes. The same is true for Thies' piano playing, sometimes playful and other times somber and minimal. I could go on and on, trying to adequately paint you images of what the music on Blue Landscapes II: Discoveries sounds like and it's easy to create those pictures in your mind if you do as I suggest and indulge in deep, attentive listening to this album. Few albums will reward such devotion as this one does. You will want to return to these "landscapes" time and time again, always hearing something new, a wrinkle previously undetected. Evaluating this album for review has been one of the most fulfilling and enjoyable listens I have had in a long time. Do yourself a favor and buy this, block out the 80 minutes you need to play it all the way through (in a quiet room), sit back and indulge your ears and your heart and your brain. You will find yourself refreshed and content at the end (except you will likely wish you had another 80 minutes to start all over again! ).